While in the throes of celebrating the decision to start an online business, you didn’t organize a merchant account — yet. You know credit and debit card transactions can’t be processed without one, but figure it can wait awhile… Launch date isn’t for another two months. So far, you’ve focused on developing your product list and getting the website built. Both are certainly important, but you won’t have much of an online business without the ability to accept payment cards. Customers won’t be able to buy, and you won’t get paid. As a result, getting to YES through the domestic merchant bank application and underwriting processes may be both difficult and time consuming. Does that scenario sound familiar? Keep in mind that a domestic merchant account may not be best for your business anyway. Consider instead a merchant account offshore. High-risk e-commerce merchants should always consider finding one. When you see the benefits they offer, you’ll consider a merchant account offshore, too. The first key benefit you’ll experience? The relatively simple application process makes it easier to obtain a merchant account offshore. This means new and small merchants (and merchants who’ve been terminated) can avoid a frustrating search. One reason is that major card brands Visa and Mastercard have segmented their global operations into several regions. Each region sets its own rules, and determines whether or not its member banks can underwrite certain types of businesses. So a line of business that might be denied in the U.S. could be considered acceptable in Asia, Europe, CEMEA or Latin America. Cultural differences and more relaxed legal frameworks in non-U.S. regions mean that offshore banks are more willing to work with complicated, unique business models. Few online businesses today operate with only a domestic customer base. In fact, one of the major benefits of doing business online is that customers can be from any country with access to the Internet. Part of the business plan you’re about to implement should be an assessment of where the likely customer base resides, now and in the future as the business grows. To which countries will you market? And which currencies do you plan to support? Setting up your business with a merchant account offshore will allow customers from anywhere to do business with you. Multi-currency options eliminate the hassle and expense of currency conversion, making it easier and more cost-effective for your customers. Choosing the right merchant account offshore to support your business establishes the foundation for your company’s global infrastructure with direct access to the worldwide marketplace. Countries in which offshore merchant accounts operate may also offer less strict regulatory environments. Fewer regulations leads to simplified business operations and reduced operating costs. Higher chargeback thresholds are another benefit of having your merchant account offshore. With a higher threshold, penalties from major card brands and bank penalties decline too. 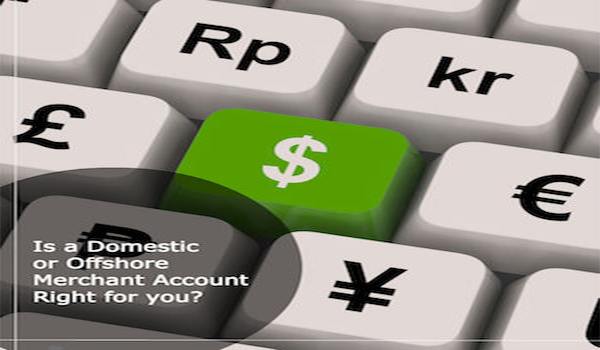 A merchant account offshore can also offer high volume support. So if your business model anticipates large monthly revenue fluctuations (frowned on by most domestic banks) you’ll be able to guard against unexpected payment processing costs. Or potential added restrictions. Many of these countries also offer low tax rates, which will reduce your tax exposure and protect your business assets from high levels of taxation. Who wouldn’t enjoy that? All other things being equal, establishing a merchant account offshore — rather than a domestic merchant account — may be the best choice to see your business profitability increase. When you’re ready to find the ideal merchant account offshore for your business, plan to work with a specialist provider. Your chosen specialist should understand high-risk business models, and the complex realities of the offshore payments processing marketplace. A specialist will know the risks associated with offshore transactions, and his services will include risk mitigation expertise in a full suite of offshore merchant account services. The first thing a specialist will do is to assess your specific business needs. Only then will he suggest the ideal structure to support those needs. And then he’ll help put that structure in place. Look for a provider with a solid record and a stellar marketplace reputation, with the technology to support your global ambitions. They should be able to give you access to a broad range of processors, and introduce you to industry contacts cultivated over many years. They’ll treat you like a partner who wants to see you succeed in your chosen business. And they’ll have the know-how and desire to ensure your processing runs smoothly and seamlessly.